An armoured Mandragora with native blossoms. 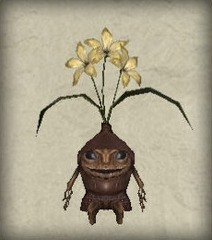 This mandragora, like the rest of its subspecies, bears metal armour and thus its movements are quite slow. Wild creatures are fond of its yellow flowers and so it occasionally plucks its own blossoms to evade predators.